Home / Postcholecystectomy - Weight Gain / Is your gallbladder (or lack of) stopping your weight loss? If you’ve never had gallstones, you’ve probably never thought about your gallbladder. However, if you have had gallstones, chances are good that you have had your gallbladder removed. Either situation has its own inherent issues, and one thing that healthcare providers rarely tell gallbladder patients is that surgery will forever impair their digestion and may make losing weight very, very difficult. The gallbladder is a small, pear-shaped organ under your liver that concentrates and stores the bile that your liver produces to aid fat digestion. Most people don’t give it a second thought until it starts to trouble them, and unfortunately, for many years, the medical establishment didn’t realize the full importance of healthy gallbladder function. They felt its removal had few, if any consequences. I am of the opinion that we were not designed with unnecessary parts, and the gallbladder is no exception. In fact, science is just beginning to understand the true importance of healthy gallbladder function and the detrimental consequences of its dysfunction or removal. Each day, your liver produces ~27-34 ounces of greenish-brownish-yellow bile, which is concentrated anywhere from 5-18 times, and then 1-3 oz is stored in the gallbladder awaiting your next meal. When you consume foods containing dietary fats, your gallbladder is triggered to release this concentrated bile into the first part of the small intestine, the duodenum, where it acts as an emulsifier to break down those fats and aids in the absorption of the fat soluble vitamins, A,D,E, & K, and any essential fatty acids. If you have ever vomited until a bitter, yellow substance came up — that was bile, and while you may not have thought so at the time – bile itself is an amazing substance. Comprised of bile acids, bile salts, cholesterol, phospholipids, pigments, water, electrolytes, and amino acids, bile is a bitter, acidic substance that breaks down fats into components that the body can use. Healthy fat absorption is crucial to our health. In fact, we were designed to eat fats rich in healthy fats. Our brains, our hormones, and even our very cell walls are dependent on a steady and healthy supply of fat soluble vitamins and essential fatty acids.1 Vitamin A is an important antioxidant that plays a crucial role in cell division, cell differentiation, reproduction, immune function, growth, and vision. Vitamin D is a prohormone which not only regulates calcium metabolism, but is essential for the functioning of the nervous system, for bone health, for muscle strength, for immune function, regulating blood pressure, hormone production and for cell differentiation. Vitamin E is a blanket term for eight different nutrients (4 types of tocopherols and 4 types of tocotrienols) that have string antioxidant properties and also play a role in immune function, healing, repair, and cardiovascular functioning. Vitamin K is a nutrient that scientists are just starting to devote research time to. It is known to play a key role in bone health, blood clotting, and heart disease, but studies are showing that it may have many more far-reaching effects. Essential fatty acids (EFA’s), such as omega-3 fatty acids, are ESSENTIAL to human functioning. Long recognized for its powerful anti-inflammatory benefits, EFA’s are required to make the cell walls of every cell in your body and they play a key role in immune functioning, musculoskeletal health, cognitive function, and heart disease. Considering the overwhelming importance of fatty acids and fat soluble nutrients to general health, it makes no sense to willingly cut out gallbladders with no plan of action to compensate for the deficit caused by its dysfunction or removal. Whether you have a gallbladder that isn’t doing its job or you have already lost yours – there is a solution. So, how does all of this apply to lack of weight loss — or worse, weight gain? In simplistic terms, the body is a finely tuned organism. We need 17 nutrients in specific quantities just to make adequate levels of stomach acid and other digestive substances. When gallbladders dysfunction, two things can happen: First, the bile gets too thick and stagnant, which creates an ideal situation for gallstone formation. Second, when gallstones impair or block the emptying of the gallbladder, fat digestion decreases dramatically, which in turn, puts your body into starvation mode. The body requires the absorption of those fat soluble vitamins and essential fatty acids, but it recognizes it is in a chronically deficient state – so it hangs on to the fat it has (which unfortunately may be that stomach pooch) for dear life. You in turn want to lose that stored fat, and may erroneously take on a low-fat diet at the advice of your healthcare provider, which only makes the matter worse. medical conditions including hypothyroidism, diabetes, insulin resistance, inflammatory bowel disease, PCOS, hemolytic anemia, etc. That’s a long list of risk factors – it’s a miracle that anyone has a normal functioning gallbladder given our Standard American Diet (SAD) and reliance on fried and processed foods. In fact, gallbladder dysfunction is so common that clinicians refer to it as the 4-F syndrome: Female, Fat, Forty+, Flatulent. However, most people with gallbladder dysfunction are asymptomatic. Studies estimate that anywhere from 67-80% of people with gallstones have no symptoms. That said, many people discount gallbladder symptoms as being related to poor digestion or other factors. Everyone with gallstones started off with thick or stagnant bile. You have to have one to lead to the other. 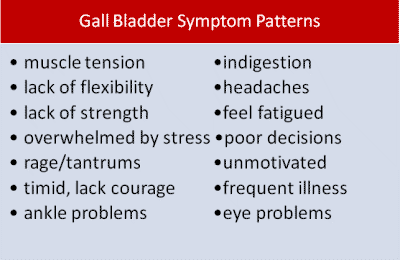 The pattern of symptoms associated with gallbladder dysfunction is so varied that many people without digestive pain may not associate their muscle pain, dry skin, poor wound healing, dry (or shedding) hair, headaches, heel calluses, or inability to lose weight despite doing everything right with a gallbladder that is not operating at par. Symptoms of gallbladder dysfunction: Most commonly: pain or discomfort after eating. This can include gas, bloating, belching, heartburn, nausea, queasiness abdominal discomfort, extreme fatigue, pain under the ribs, particularly on the right side, or shoulder pain. Additional symptoms include headaches over the right eye, constipation or diarrhea, light colored or ‘floating’ stools, dark urine, offensive body odor or breath. People with gallbladder dysfunction tend to have bowel extremes — they experience diarrhea (up to 10 bowel movements per day) or constipation (often having days between bowel movements) and rarely have normal bathroom habits. Have you had your gallbladder removed? You are not alone. Over half a million gallbladders are removed every year in the US. It is one of the most commonly performed surgical procedures. Symptoms of postcholecystectomy syndrome (PCS): gas, bloating, belching, heartburn, nausea, queasiness abdominal discomfort, extreme fatigue, pain under the ribs, particularly on the right side, or shoulder pain. The need to run to the bathroom immediately after eating is fairly common. Additional symptoms include headaches over the right eye, constipation or diarrhea. Notice the symptoms are almost exactly the same for people with NO gallbladder as for those with a dysfunctional one? Researchers estimate that at least 40% of people who have had gallbladder removal continue to experience significant abdominal pain.2 It is estimated that 5-40% of people who have had a cholecystectomy experience long term symptoms from it . 3 One British study looking at the after-effects of gallbladder surgery found that 87% of men and 68% of women experienced weight gain after cholecystectomy and urged physicians to caution patients about this ‘side-effect.4 I can easily say that in my 12 years of practice, I have NEVER had a gallbladder patient tell me that they were informed of the likelihood of weight gain prior to their surgery! Having a dysfunctioning gallbladder or having no gallbladder are both associated not only with difficulty losing weight, but with weight gain. Anecdotal reports are abound of women having few issues maintaining their healthy weight until they had gallbladder removal surgery. On a functional level, we know that nutritional deficiencies are associated with difficulty losing weight, and by drastically impairing fat digestion through having stagnant bile or by surgical removal of the gallbladder – we create the foundation for broad-spectrum health disorders. Our bodies are designed to maintain an equilibrium, or steady state. It craves balance. So when we have gross nutritional deficiencies, our bodies inherently want to hang on to its stores of fat and nutrients. It doesn’t want to exacerbate its deficient status by losing more of anything – and that includes your love handles. 1) First and foremost, you need to concentrate on eliminating the nutritional deficiencies. This is imperative if you want to get your body out of starvation mode. I suggest that you take a high-quality, highly absorbable multivitamin. Look for a high potency multivitamin that contains more than the 100% RDA amounts. Those amounts were designed to keep a person out of gross deficiency status, they are not amounts your body needs for optimal functioning. 2) The second thing I recommend is supplementing with pancrealipase and organic beet extract. I carry two different formulas – one for people with gallbladders who need to thin their bile so their digestion works better and another for people who no longer have a gallbladder and who need to add ox bile extract in addition to the pancrealipase and organic beet extract so they can start breaking down those dietary fats , get themselves out of a deficient status, and start losing weight. Either formula can be ordered directly from me (message me through facebook), or through the manufacturer. These supplements are only sold through licensed healthcare providers, and I am prohibited from publishing prices publicly, but if you visit my facebook group https://www.facebook.com/groups/weightlossresources/ and check the FILES section. I have included complete ordering information along with a discount code for my clients. 3) Limit your intake of refined carbohydrates. Not only are these typically ’empty’ calories, but they rob you of minerals like magnesium and chromium, and your b-vitamins. They also induce insulin spikes which further stress your liver and gallbladder. 4) Increase your magnesium intake. Whether you take oral magnesium preparations, or you use epsom salt baths – magnesium has been shown to prevent gallstone formation. It is also required for making appropriate levels of stomach acid. 5) Increase your intake of taurine-rich foods. Taurine is one of the major amino acids found in bile. Healthy digestion depends on getting adequate supplies of taurine. Meat, eggs, seafood, certain dairy products, and brewers years are all good sources of dietary taurine. 6) Eat healthy fats! Your body needs fat in order to lose fat. If fat digestion troubles you, start slowly with small amounts of unrefined organic coconut oil and slowly add other healthy oils into your diet. Let your body accommodate to them. Healthy fats include grass-fed butter (which is a source of vitamins A,D,E,K, as well as selenium, and CLA), ghee, lard, egg yolks, organ meat, palm oil, olive oil, most nut oils, etc. Bad fats include corn oil, soy oil, canola oil, sunflower oil, safflower oil, cottonseed oil, margarine, and anything listed as ‘hydrogenated’. These refined oils are a source of omega-6 fatty acids which not only contribute to obesity but cause inflammation within the body, and that includes liver and gallbladder inflammation. In short, having gallbladder problems or no gallbladder whatsoever need not cause you issues. There are simple solutions that allow your body to work the way it was intended to. You can get the weight off and avoid the bizarre food cravings that come along with those nutrient deficiencies. You can feel normal after meals. You can have normal bowel movements, and you can get rid of the fatigue that overwhelms you. If you combine healthy food choices along with the simple supplements I suggest, you will see results. If you are able to combine the two with lifestyle improvements you will see results that much faster. I sincerely wish that more medical providers educated their patients on the detriments of gallbladder surgery before they submitted to it, so they could take preemptive action, however, in the words of Mick Jagger, “you can’t always get what you want, but if you try sometime, you just might end up with what you need”. So, in closing, I hope this information is what you need. Please visit me on facebook at Weight Loss Resources with Dr. Miranda. If abdominal pain persists, you may have a problem caused by something other than the gallbladder. Other possible causes of abdominal pain include irritable bowel syndrome, inflammatory bowel disease, stomach ulcers, or pancreatitis. Please seek the advice of your licensed healthcare provider to rule out serious health conditions. Are these 4 hormones making you fat? Post-cholecystectomy diarrhoea: a running commentary Copyright © 1999 BMJ Publishing Group Ltd & British Society of Gastroenterology. 1. Bates T; Ebbs SR; Harrison M; A’Hern RP.Influence of cholecystectomy on symptoms. Br J Surg. 78(8):964-7, 1991 Aug. Thank you so much for this article! I had my gallbladder removed last year and have been putting on weight like crazy. It’s making me go insane, especially because I feel hungry all the time. I am definitely interested in (natural) supplements to help me! Thank you so much for this article! I gained so much weight when my gallbladder started acting up and even more once it was removed. I will definitely be purchasing the recommended supplements and will visit your Facebook group page. Other than surgery recovery I’m also juggling untreated hypothyroidism and gastritis, do you have any general advice for that? Again, thanks so much for this helpful article. I get my gallbladder out on Tuesday and this helped a lot and I hope to do some of the things you mentioned to help me lose weight.. Thanks so much!! I had my gallbladder removed in Jan. of 15, and have been putting on weight in my stomach every since. My weight had been the same all my adult life until they removed my gall bladder. I had a stone shoot out and lodge into my pancreas which caused severe pain under my right breast. I thought I was having a heart attack. It took them a couple of days to after a scan and a MRI to see if the stone was still in my pancreas, then since my bladder had stones, they decided to take it out. Nothing was ever said about the side effects it would have. Now I am fighting this weight gain. Just last week I told my primary doctor I was worried about my weight, and he checked my thyroid which was normal. I have been walking and cutting back on my eating, but cannot lose weight. My husband is in the same shape as I for he had gained weight, but no energy to do much exercise. I am thrilled to read this article and hopefully I can start doing something about it now. Thanks so much. Thank you for your kind words. There is a lot that you can do, and supplementation certainly can help. You can order the supplements I most frequently recommend directly from the tab on the blog too for your convenience. If you have not joined my facebook group – Weight Loss Resources with Dr. Miranda, please do so. There is a lot of wonderful information there to get you started! Thank you so much for posting this article! I had my gallbladder out 8 years ago when I was 25 and luckily I didn’t start feeling the side effects discussed in your article until about 3-4 years ago. Then it all happened fairly quickly: skin discoloration, acne, weight gain all around my stomach, fatigue, but the most frustrating part is the brain fog/memory loss. I hate that I can’t quickly recall things like I used to, or when I honestly can’t think of a simple word during a conversation or meeting. Luckily I found a wonderful naturopath last month who gave the same advice of supplementation. Can you tell me how long you think it takes to notice a difference in the weight gain and brain fog? I’m assuming since it was a gradual process for my body to start storing fats that it’s a gradual process to stop storing them as well. Thanks for your help! Thank you for this.. My Dr. just recently suggested gallbladder removal because of my intense heart burn… I will definitely NOT go along with his suggestion.. Too many doctors are jumping the gun nowadays and performing unnecessary surgeries and then having the patient suffer the consequences down the road. Wow! How I wish I would have had this article years ago! I had my gallbladder removed at the age of 16 (the second youngest patient in the hospital to do so) and I was NEVER told about any symptoms after it’s removal. In fact, I was told that “the gallbladder does little to nothing really…” Had I known then what I know now, boy would it have been different. After my surgery, I was told that it would be a little while before I “bounced back to normal.” Now, I’m not saying that I was really skinny when I had it removed, but I was no where near being over-weight. By the time I was 19, I became the heaviest I have ever been. It was the biggest struggle of a life time. Once I went off to college, I was able to lose some of the weight by constantly walking everywhere, moving heavy equipment (art major), and eating less fatty foods I was able to work off a lot of excess weight and become just ‘over-weight’ again. At this point I have been able to keep my weight the same, not losing anything, but definitely not gaining any either. I have been getting so annoyed that I have tried EVERYTHING from extreme dieting and exercising to no avail. So, thinking back to what led to this and really wanting to know if lack of a gallbladder was doing anything to me, I found this article. Totally makes sense!!! I want to thank you for this. I know that I will begin another attempt at getting healthy, this time on the right foot. I have gallstones I am suppose to get my gallbladder out but have not yet,I had one attack an I think it was do to pregnancy? It happen a few months after giving birth.I also have pcos but have it under control but gained so much being pregaunt I need to lose weight,afraid to take out gallbladder an afraid off an attack to keep it in,will ur pills set my gallbladder off? Please help,doctors say take it out,I have 3. I’m so desperate for help i’m going crazy. I’m only 19 and I can’t stop gaining weight. I get extreme pain whenever I eat and nothing will stop making me look like a huge whale. I started the school year at close to 157 and I have been good all year. I eat gluten free, I never eat junk food (literally never) I eat salad, I eat rice, I eat fish, i’m almost the definition of a perfect eater yet now I’m only a couple pounds away from 170. No matter working out or not I gain weight, I need help! I want to lose weight so desperately and can’t. I think it has something to do with my gallbladder but after reading all these comments I don’t want it taken out just to gain more weight! Please anything will help.